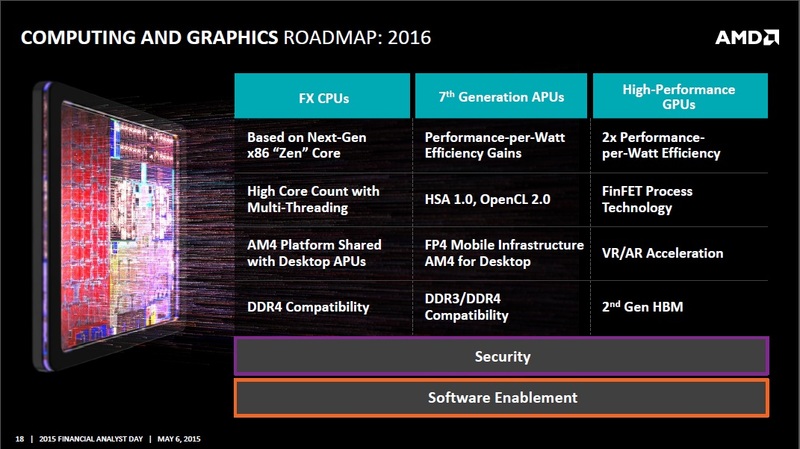 AMD has finally broke its silence on its upcoming high performance x86 CPU core “Zen” at the company’s Financial Analyst Day. The highly anticipated high performance x86 CPU core is shaping up to be a true contender that will bring competition back to the CPU market. We exclusively reported two months ago that AMD will be unveiling its new CPU and GPU cores at this event today and that’s exactly what they did. We also first broke the news about AMD’s next generation high performance core back in September of last year. At which point AMD’s then CEO Rory Read revealed the code name for the company’s upcoming high performance x86 CPU architecture. Prior to then we only had knowledge of its sister ARMv8 core code named K12. Today however we got a lot more than just a code name. 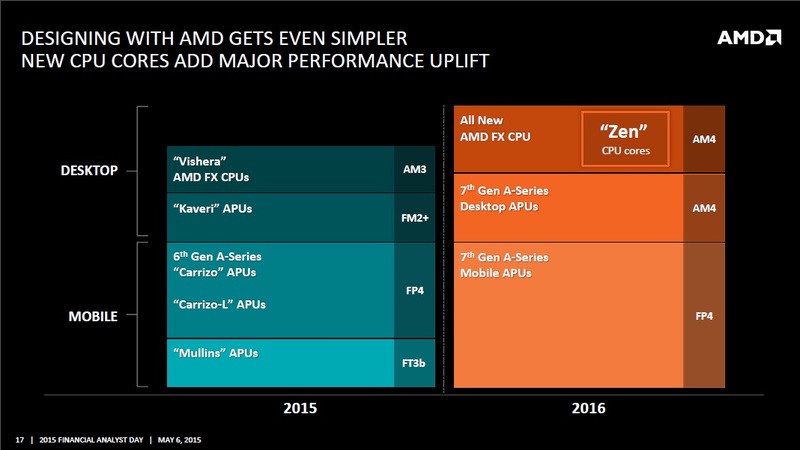 AMD revealed the major features of Zen, a rough estimate of how it performs and when it will be available. 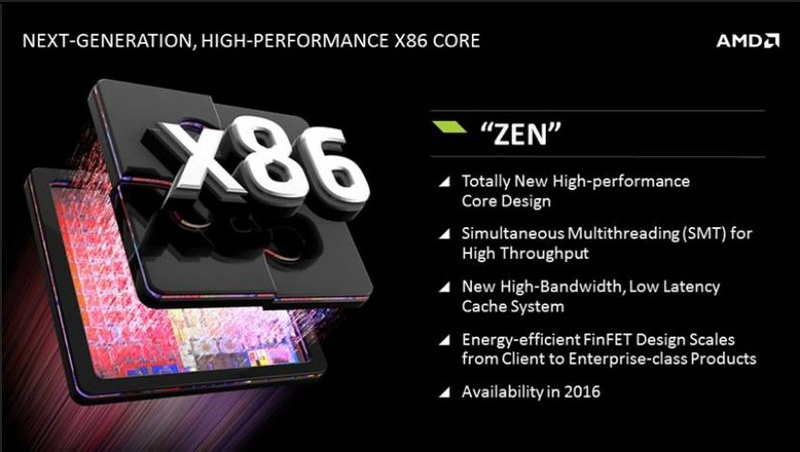 Zen will be AMD’s successor to the Bulldoze family of cores. It will be the first ever CPU core from the company to adopt SMT , Simultaneous Multithreading. It will also the first entirely new CPU core after the company’s previous CMT, Clustered Multithreading design featured in the Bulldozer family. In addition to SMT, Zen also features a new high-bandwidth low latency cache system. Mark Papermaster, AMD’s Chief Technology Officer. 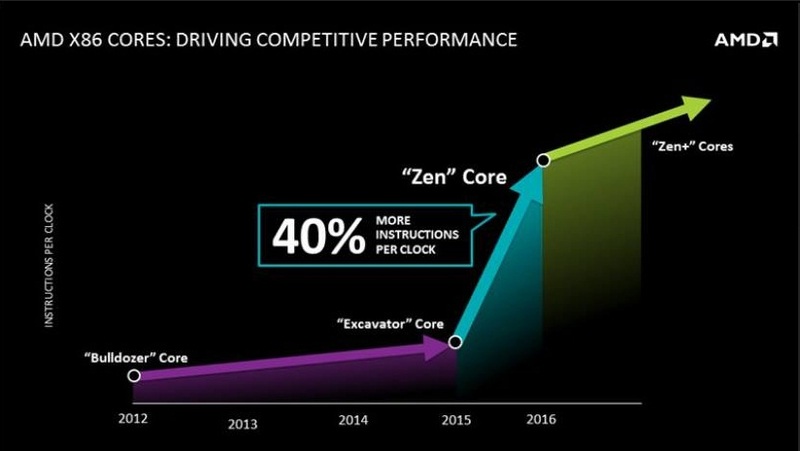 Revealed that Zen will have a huge improvement in IPC, Instructions Per Clock, vs Excavator. AMD’s latest and last, yet unreleased, Bulldozer family CPU core. A 40% increase in IPC would represent the largest jump in IPC ever for the company. We’re not particularly surprised but still very excited about this huge improvement. Mark Papermaster also made it a point to highlight that this 40% performance improvement figure is independent of the manufacturing process. So it’s a permanent architectural performance improvement that will always be present regardless of the process node flavor chosen to make a Zen based product. To put this massive leap in performance into perspective a 40% IPC improvement would put Zen on par with Haswell according to the aggregate single threaded PassMark database. That’s based on Steamroller CPU performance, so without even accounting for the IPC improvement with Excavator. Couple that IPC improvement with SMT support and affordable Summit Ridge 8 core CPUs that are on par with Intel’s $1000 i7 5960X Extreme CPU and you’ve got an extremely competitive product. The new family of high performance FX CPUs which appeared in previous leaks as “Summit Ridge” will feature SMT CPUs with high core counts and DDR4 memory support. The platform will be based on the new AM4 socket and a new yet undisclosed chipset. Unconfirmed leaks indicate that Summit Ridge will feature CPUs with up to 8 Zen cores and 12MB of L2 and L3 cache. But that is yet to be confirmed as they may actually have more CPU cores than what is rumored. Stay tuned as we bring you up to date coverage of breaking news at AMD’s live Financial Analyst Day event.